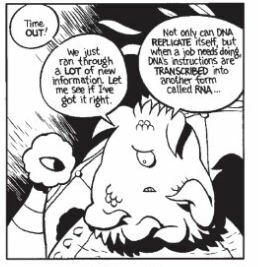 In my post about the book Why Evolution is True, I mentioned that the few pages I struggled to understand were about genetics and DNA and that I had requested a comic that explains the basics because I was determined to make sense of it. I'm happy to say that I followed through and read The Stuff of Life as planned. The setup is this: an alien life form called the Squinch are suffering from some sort of genetic disorder and sent a representative to Earth to study what we know about genetics in hope of helping their species. The representative has returned to their planet and is explaining all of this to their leader who is learning it along with us. He begins at the molecular level, gradually moving towards the larger subjects of inherited traits and diseases in the population, and about the study of genetics and how that is being used. Initially I thought the science fiction framework was a little hokey, but I came to appreciate the occasional relief from the barrage of information. Now and then when the material became very dense, we're taken back to the conversation where the leader will say something like "Let me make sure I understand this," and then summarize what has been discussed, which was incredibly helpful. I probably understood close to 80% of the material. Of that, I don't think I retained more than half. It's like I can grasp it for one glorious, lucid moment before it flits away leaving me muddled and hazy again. That's just how it is with me and science. Some interesting facts have stucks with me though. For instance, that all men today carry a Y chromosome inherited from a single ancestor, and all women carry mitochondrial dna originating from a single source as well. What? I barely understand this, yet am surprised and intrigued. 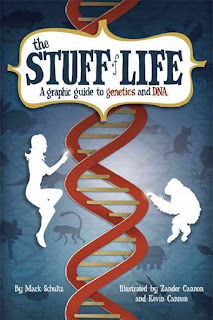 This will probably be covered more in Last Ape Standing, which I have out of the library and hope to fit in my reading schedule sometime soon. (I just have to finish Wolf Hall and two book group books first!) I'm really happy that I'm following the reading path I began with Why Evolution is True - maybe after reading a few related books some of this knowledge will actually sink in and stay with me.